This device is designed to monitor your child’s health from a safe distance. Raising a child is one of the most stressful tasks any parent can take on. While there are plenty of devices on the market designed to help make things less stressful, most of them all require direct contact with the child for monitoring. Raybaby is the world’s first and only non-contact sleep and breathing tracker created for moms and dads to make their lives a bit easier. It contains a few features designed to make raising a child less stressful. Using a built-in technology based on the principles of ultrasound, it notifies parents when their child is running a fever. It also recognizes warning signs and instantly sends alerts. By monitoring variations in activity, the device also can spot respiratory illnesses and allergy attacks such as Bronchitis and Asthma. The sleep tracking component of Raybaby is designed to tell you how much your baby has slept, how much he/she needs to sleep and sends alerts when the baby wakes up or rolls over. The recommendation system also helps with the sleep training of babies. In addition to monitoring health, Raybaby also builds up a collection of the child’s most precious moments so that users can easily share when the child said their first words and other memories. Raybaby enables parents to keep in touch with their child by using an integrated infrared video camera that allows live video streaming in pitch darkness, live-video streaming, built-in speakers, and audio monitoring with a highly sensitive microphone. The custom-made companion mobile app indicates the current mood of the child, provides comprehensive easy to use information and provides helpful tips and recommendations. 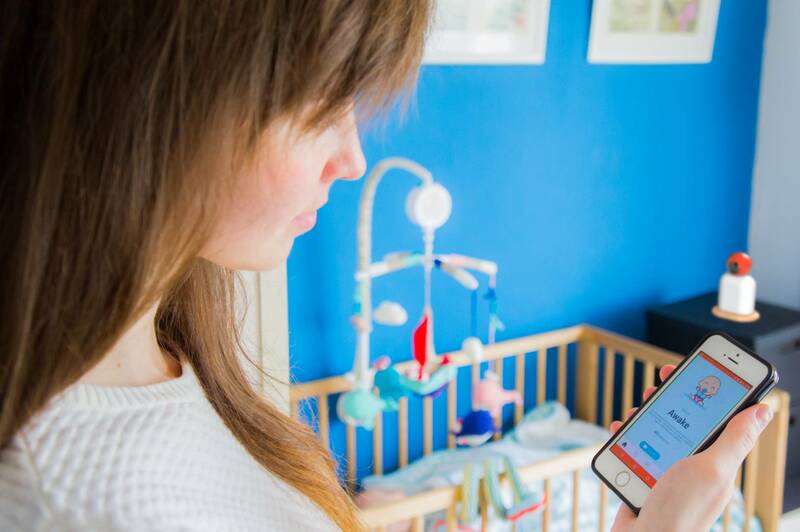 After the initial signup process, it starts searching for Raybaby through WiFi. After detection, a one-time sync only takes 10-20 seconds to complete. The home screen displays varied information about the child’s status such as sleeping, sleepy, or awake, along with live respiration rates. 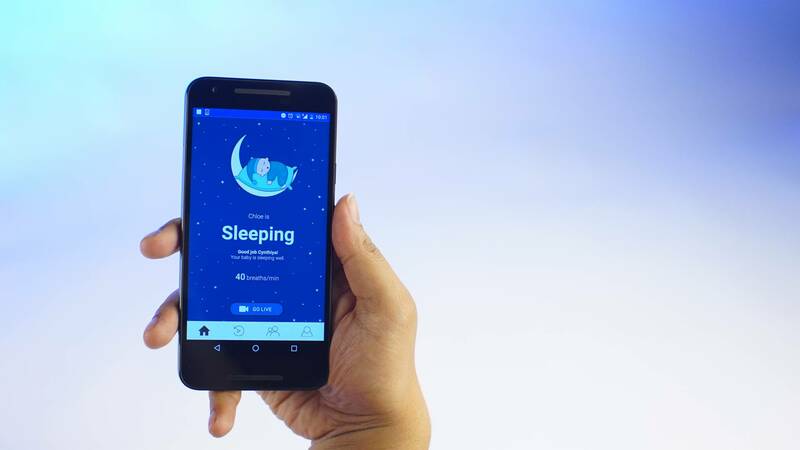 In addition to these details, the bottom of the home screen shows sleep pattern graphs to make it easy for parents to track daily health and sleep goals. Finally, the social element of the app enables parents to share their baby’s pictures, videos, health data, and other notes with other family and parents. Raybaby is built on an AI platform that is intuitive and molded to the child’s sleep pattern and respiration. The software enables parents to stay up to date on their child’s REM requirements and also provides recommendations to ensure the child’s development is optimized. As far as specs go, Raybaby can be kept as far as 2.5m away from the child. It’s equipped with an ARM Cortex A5 processor with a ½ core and 1 GHZ of power. It comes with a 5V power supply and battery backup along with a built-in SD card for storage. To date, the makers of Raybaby have raised over $123,000 via crowdfunding with an estimated shipping date of September 2017. Early bird pricing for the device starts at $149 and includes a Raybaby device, charging cable, iOS/Android app, and a 30-day money back guarantee. Raybaby comes in red, blue, and yellow; three colors which were chosen because they are the primary colors learned by growing toddlers. I have always been a fan of app connected devices and the fact that you can share with others right from the app is a major bonus. It might also help when you are dealing with a tough sleeper and the doctor wants to know how things are at home at the time of the problems. Showing up on the market with a 30-day money back promise is pretty tight these days. I would be willing to test it out for those 30 days and see what this thing can tell me. If I am learning things I can’t tell myself, this is a go to product. Adding the AI to the program and the baby monitor is a major game changer. I really like the fact that you are going to be getting plenty of information that you can then use as a parent that wants the best for your child. Bravo for taking a step forward in the industry.